The Knebworth Community Chorus was formed to sing in the 2010 Village Festival. Since then, the choir has performed at each Festival and every Christmas under the direction of Musical Director Derek Harrison. We welcome all local singers who are enthusiastic about and interested in singing. There is no audition and you do not have to be able to read music. We have a wide range of experience and ability in the choir, and not all of our singers are able to sing in every concert. For each concert we come together for a few rehearsals over around 6 weeks before the concert date. We rehearse at Trinity Church, Park Lane, Knebworth, SG3 6PD, and times and days vary so as to allow as many as possible to join in. Knebworth Community Chorus is constituted as a Society and is a member of Making Music. 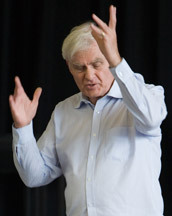 Derek Harrison has conducted choirs of all sizes including over 800 performers in major concerts at the Royal Albert Hall (4 times). Derek has been Musical Director of Hertford Choral Society for over 30 years and, at the moment, directs four other choirs. Derek is a singer, including in the St Albans Cathedral Choir, organist, examiner - and resident of Knebworth.